Emma has had the opportunity to present at conferences and schools around the country. Her writing has been published in the anthology Typed Words, Loud Voices: A Collection, Special Parent Magazine, HALO’s 2014 edition of Voices and on her blog, Emma’s Hope Book. She would like to continue opening people’s minds to differences. You are welcome to follow me on this adventure. This is a really expressive post and applies to other groups as well as such as the physically handicapped and older Americans. Did you know here in Massachusetts there are state institutions who’s job it is to prove people incompetent and anyone can anonymously call these agency and anonymously tell them that someone is not taking care of themselves and need guardianship. You really captured my fear of being put into a garbage ward. Best of luck and please keep on writing. Emma, my daughter Elizabeth, reminds me so much of you. I’m sad that she hasn’t been able to find her voice yet, but we never give up. Your thoughts are so important to me, as they give me a glimpse of what my daughter is dealing with. It helps me be a better mom to her, so from my heart, thank you. Love your openess of sharing your feelings. You are so invigorating to read and take in Emma! I have followed you from your start with moms help. She knows I used to teach Autistic children and I have a step-Daughter who was never worked with before my fiancé brought her to lbe with us. She enjoys your truths, splendid ways of showing who you are. She no longer is a wallflower, but a butterfly with the best of you all! Thank you for sharing Emma. Would you mind if i printed this post to share in the staff room. I am a teacher and i would love my colleagues to read this as many have misconceptions that you have eloquently addressed. Hi Lee, just to clarify, do you mean Emma’s description of herself on the “Emma” page where you’ve left this comment or her most recent post entitled, “I am Emma”? I read I Am Emma and I have to say I was mentally taking down notes on the descriptiveness. Emma, you are a fantastic writer even if some haters say you aren’t. You are pretty much my new role model. 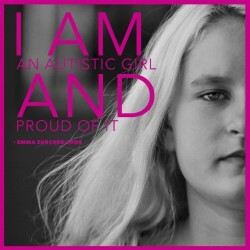 Emma, you are a very inspiring person. You are an AMAZING writer, I just can’t believe it. Keep on doing what you are doing! When I read this article, I honestly thought it was written by an adult–I was so shocked when I went to the “about” page and learned that you’re just 13! You’re so eloquent and insightful–not just for your age, but in general–and I really think that’ll take you places. Keep on being awesome! For when my comment shows up–I apologize in advance for any confusion. I meant to post it on I Am Emma, but somehow wound up posting it here by accident…oops! Sorry ’bout that.